Salto SpecialGymnastics under the watchful eye of head coach Hazel Coates have been using Belvoir Activity Centre facilities for over 20years, producing elite gymnasts in both rhythmic and Artistic gymnastics. The club which is made up of volunteers who use our centre every Wednesday night provide a high level of coaching and fun to all that attend. 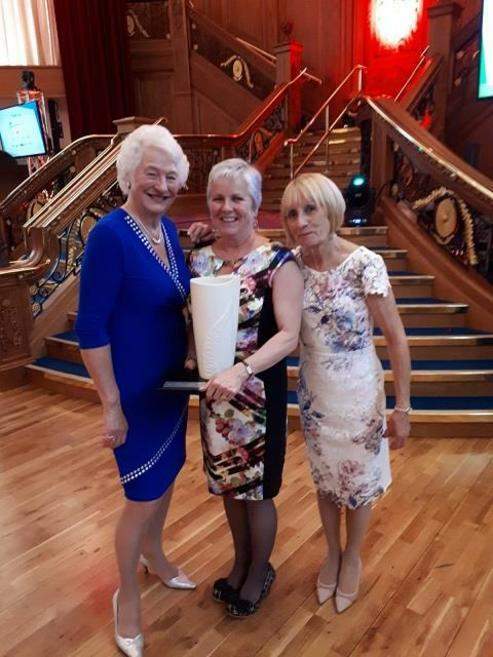 Hazel and the team recently attended the Disability Sports Northern Ireland 20th Anniversiary dinner held in the Titanic Museum Belfast, and this year the club was given well deserved recognition for thier achievements when they were presented with the Disability Inclusion Club of the year 2018 award by Dame Mary Peters. An amazing recognition for all the hard work volunteers from Salto put in to the inclusion programme. Here at Belvoir we firmly believe that inclusion is a key part of better people and communities, our inclusion programme is improving year on year with not only the achievements above but Salto Special Football Club and Disability Sport NI wheelie Active club continuing to grow and develop within our centre. Congratulations to all the volunteers and participates from Salto Special Gymnastics club.